Is the Speedmaster underwhelming for many? Thread: Is the Speedmaster underwhelming for many? Re: Is the Speedmaster underwhelming for many? I'd agree that the Speedy Pro is indeed a touch underwhelming, especially compared to modern 'maxi' dial options like current Rolex/Omega, etc offerings with gorgeous dial work and complex brushing on the case/bracelet. But... that's sort of the whole point of the Speedy Pro. It wasn't intended to be an attention-getter, or a showpiece, or a conversation-starter. It's as close to a pure tool watch as you'll find, despite the current price tag. To my way of thinking, the beauty of the Speedy Pro is that it's so basic, so pragmatic, so heavily optimized for a single task. If you're going to like it, you'll like it for those functional qualities, and find the aesthetics in how well it's suited the task it's built for. I've said often enough that the Speedmaster Professional operates by stealth. You can see one a million times and it barely registers on your radar. And then, you happen to glimpse a picture of one on the web, or you see somebody walk past you in the street wearing one and it suddenly hits you all at once just how cool this watch is. At least, that's how it happened to me. I always knew of the classic status of this watch, about the NASA link, etc. But I just always admired the fact that it remained pretty much unchanged since the mid-Sixties. For me, that was the allure of this watch. I always thought I would get one for myself someday. But, because it had been around for so long, I wasn't in any great rush to buy one. Then, back in my watch selling days, our store had a very good year and we were given the option to choose a watch to a certain value. I nearly went for a TAG Heuer Carrera, but I quickly came to my senses; "What watch do you keep saying you're gonna buy, but have yet to get around to doing so? ", I asked myself. I opted for the Speedmaster Pro, even though I had to throw in some of my own money because it was a little beyond the value allotted to me. I got the watch and wore it on and off for about a month. Yes, it did feel slightly anti-climactic when I first got it. Then one morning, I was putting it on my wrist and the morning light hit it at a particular angle and I instantly realised why this watch has the status that it does. It's not a watch for everybody. I used to get customers in the store who would ask; "I want the watch that went to the moon." "Okay, this is it. Now, the glass is Hesalite rather than sapphire, which means that it can tend to scratch a little easier and a hard knock from the wrong angle will break it. However, Polywatch will remove most scratches, and replacing a broken Hesalite crystal will be considerably cheaper than replacing a sapphire crystal. The water-resistance is 50 metres, good enough for splashes of water, but I don't recommend swimming with this watch on for any length of time. It has no date, but you can use the chrono hand as a date pointer for the first 31 minute markers on the dial. Takes a couple of weeks to get used to. And finally, it's a hand-wound watch, not an automatic. You will need to wind it." This information would usually scare off six or seven out of ten customers. The ones who hadn't done a little research on the watch. The remaining three or four customers would purchase the watch. There are aspects of this watch that are considered antique technology by some folks. But this watch isn't designed for them. It's a classic chronograph any way you look at it. 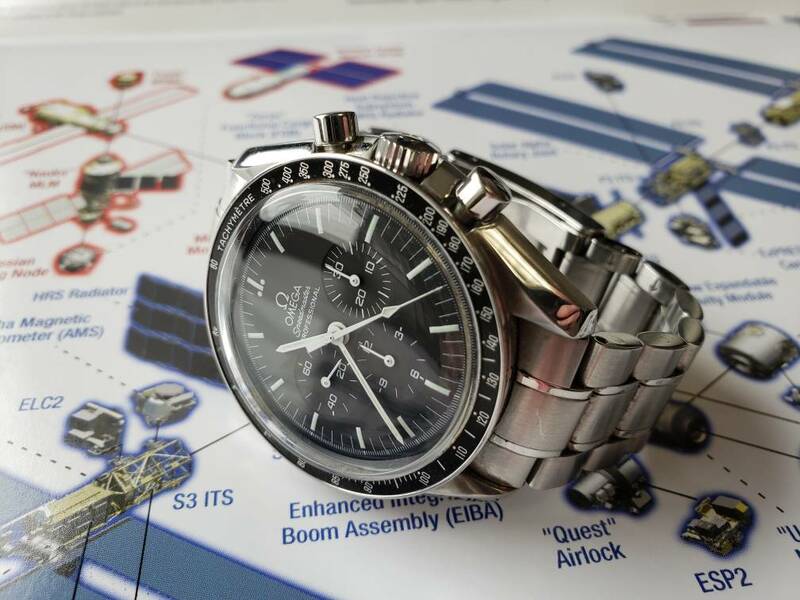 Though I don't yet own one, I feel the exact same way.... such was my journey with the speedmaster. I'll have one. Zero doubt. Overstated online, understated on the wrist. I just got my first moon last week. I haven't put my sub or 111 back on yet since it arrived. I really, really like it. I even enjoy winding it for the day. You can't really go wrong in my opinion. If anything at least there are a great deal of options to choose from. BufordTJustice, rfortson and kadmus like this. I feel like it’s under reported that the crown guards on the Professional model make hand winding a chore. I don’t dislike the ritual on my other hand wound watches where the crown is more accessible. It’s not terrible enough to make me regret the purchase though. I’m still very happy with mine. I've never understood this. I've owned mine for nearly 20 years and wind it every day, and never have I had any issues with winding it. It's buttery smooth and the crown is easy to work. I've seen this comment from others, so I know it must be an issue for you and plenty of others, but it's really a head scratcher to me. Also, I work at the Johnson Space Center where you'd think they'd be ubiquitous. I know in the past 25 years I've seen less than 5. And out in the real world, I think I've seen a couple of others. That's in the 25+ years that I've been actively aware of/looked for the Speedmaster Pro. Yes, they are common here and among watch enthusiasts, but in the real world, you'll rarely see them in my experience. Not that I really care, as it's such a cool piece. teeritz, Paulsky, HiggsBoson and 2 others like this. I own two '78 Speedmaster's and they are some of my most favorite in my collection. One I call my beater and the other is mint. Love them. Paisley is always in fashion. The Speedy was my grail for a long time. After I finally bought one, I was kind of disappointed. It was sort of like going on a date with the captain of the cheerleader team/ prom queen and discovering that she's got some annoying and even offensive personal habits. I don't view of the Speedy as "a thinking man's watch" any more than a Volvo is "a thinking man's car".....but sometimes people buy these things because they want others to view them in that light. I suppose my biggest problems with the watch are 1) it is vastly overpriced by the manufacturer....these sold for $225 in 1975, and while we've certainly had inflation since then, it has not been anywhere enough to bring the price to where it is. They actually SHOULD sell for around $1400. The current MSRP is artificially set high to make the product appear to be of greater quality than it actually is. The second problem is the very high cost of service every 7-10 years...many hundreds of dollars, during which time the watch is sent away and is gone for weeks at a time. This doesn't make economic sense to me. There are any number of watches that you can own for 20+ years with zero service, just wear them until they stop...and then buy an entire new watch for less than the cost of even ONE Omega service. So...the Speedy isn't for me....but it still might be for you. I understand that the Speedy isn't your preference. It's not my first love, either. But your other statements exclude virtually all Swiss swatches and even some very nice Japanese pieces. Which is also fine. No, it's must for any mechanical sports/aviation watch collector. It is well made, has an unparalleled history and it is a great value. I agree with your first point, and I think that's where the underwhelming feeling comes in. This watch has remained nearly unchanged for decades, but the price has steadily gone up. Compared to a Seamaster Divers 300m for about the same price, the speedy feels old fashioned and less well made. Your second point is not limited to the speedy, all mechanical watches have the same issue of needing a costly service every 5-10 years. Just the reality of this hobby. The Speedmaster is a vintage watch that you can buy new with a manufacturer's warranty. Hand winding is no different from many others (yes, I've owned many). Accuracy is more than fine for any normal application. I also love the plastic crystal and polish it 2 or 3 times a year, whether it needs it or not. Now given all that, maybe it's not for you. That's okay. I love the heritage and understated looks but not everyone has the same desires/taste. If you think it's for you, try it. You can always sell it for a good price. flyinghell34, Alex_TA, BufordTJustice and 4 others like this. Once and for all... Is the speedmaster reduced (black dial) a womans watch? New fantastic strap for the Speedmaster!